Discussion in 'Announcements Area' started by Cats777, Jul 20, 2015. This is the only "RIP Iwata" picture I saved, because it features one of his most iconic lines and it's one of the few that doesn't have random bleeding heart video game characters. It also features the former leaders of Nintendo, happy to see their old friend. Iwata would want us feeling happy and inspired by his achievements and positive attitude towards everything. 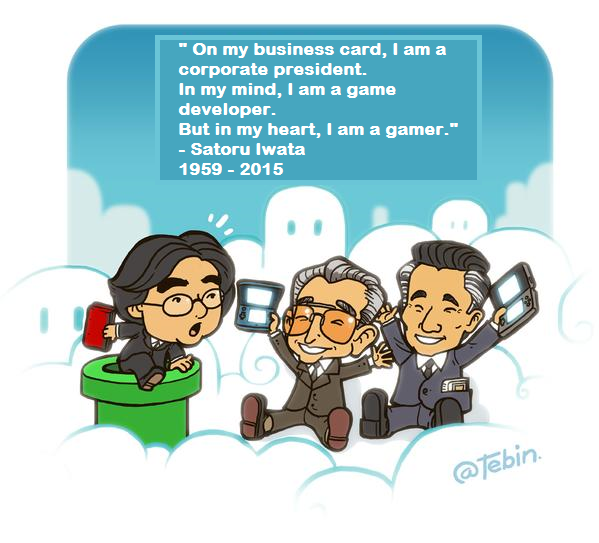 As every gamer already knows, Satoru Iwata died last week and was funeralized just recently. I'm not gonna write a whole eulogy right here, as I'm a man of few words; and the words that come out might be a jumbled mess. I will say, however, that he was a glorious programmer who managed to rescue, from seemingly impossible hurdles, some of my favorite games from my childhood. Without him, Kirby, EarthBound, and Pokemon G/S wouldn't have been the same. They probably would not have even existed. So I thank him for that. I didn't know him as a person and only saw him on E3 streams(I didn't even watch the Nintendo Directs), but a lot of people, even competitors, looked up to him due to his unrivaled leadership and projection of good vibes directly to everyone. He once said, "Above all, video games are meant to be just one thing: fun. Fun for everyone." And he stuck with that mantra until the day he died, against all odds, against tough competitors who churn out "mature" quickie twitch-fests with mountains of cash vacuums, and against greedy shareholders who don't care about family-friendly fun. Iwata wanted to make money and fun. It turns out that it's hard to do both without some degree of innovation, which is why we have the DS and the Wii... and Amiibos. Actually, Iwata cared more about fun due to the fact that he cut his own salary in half after the disappointment of the 3DS launch. In the end, it was all about the games, the same kind of games we all loved since the third generation. Children 20 years from now will remember the cutesy but memorable Ninty games that they play today(if they don't remember all the shootan games or Minecraft), the same way we remember the Ninty games we played 20 years ago. It's all thanks to Satoru Iwata keeping it old school. The worst part about Iwata's death was that he died at the young age of 55 and was still in office, unable to name a suitable successor. He lived an incredibly accomplished life, but it's hard not to wonder about what he would have accomplished had he lived just a few decades more. VR Balloon Fight? Car Race ]I[? An actual Metroid sequel? Whatever the case, it's yet another example that life is totally bananas. Perhaps that is what he was trying to make us understand all along. I said I wasn't gonna write a eulogy, and there I went. Thanks, Iwata. This update showcases some of Iwata's achievements. One track for every year he has been president. While certainly not the first Nintendo game he worked on as a programmer, Balloon Fight was what put Iwata on the radar. The game was so memorable for him, that he re-released it over 10 times! This remix was made by the game's composer, Hirokazu Tanaka. Kirby would not have been a thing without Iwata. While it was Masahiro Sakurai who created the character, Iwata was the one who developed the gameplay mechanics, with his die-hard vision of accessibility. 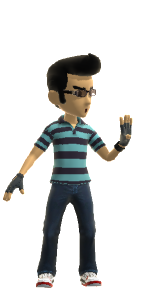 After being in development hell for 4 years and presenting many problems in its code, EarthBound was at risk of becoming vaporware. Iwata, being the god of programming, claimed it would take a shorter time to re-write the entire thing than to debug it. And so, 6 months later, the game was released. From simply staring at Pokemon R/B's machine code, Iwata managed to materialize its battle system into Pokemon Stadium in just one week! Shigeki Morimoto of GameFreak ejaculated, "Wh-What kind of company president is this!?" Iwata wrote a compression algorithm that would allow the whole Kanto region, complete with its native pokemon, to fit inside the Pokemon G/S cartridge. It was like getting two games in one! Iwata helped develop the Smash Bros franchise into what it is today. Before it had Nintendo characters and was called Dragon King: The Fighting Game, Iwata was the lone programmer assisting the creator, Masahiro Sakurai, in his spare time. 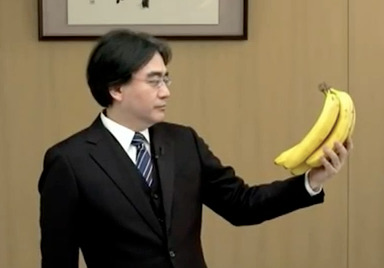 Iwata also lent a hand in convincing everyone that adding Nintendo characters was a good idea. Even during the development of Melee, which was riddled with bugs and would have surely missed its release date, Iwata was given the reins; and he made sure it would be released on time. Today, as it did yesterday, there is a downpour in Kyoto. Kyoto's sky is also crying. I wish I had a StreetPass feature that could connect with heaven. I would run out and buy a DS with that feature right now just so I could send you my thanks. When I'm parting with a friend, regardless of the circumstances, I find it best to just say, 'See you later.' We'll meet again. After all, we're friends. That's right - nothing unusual about it. I'll see you later. So let's meet again. No - I suppose we're already meeting. Right here, right now. Remember to have your bile ducts checked regularly. RIP Satoru Iwata. This counts as 2 updates, BTW.